The solar powered airplane Solar Impulse takes off from Brussels Airport, in Zaventem. 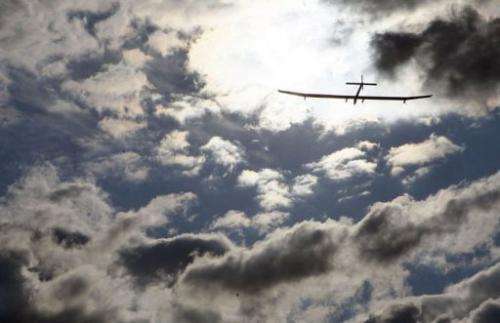 The pioneering aircraft took off at 1637 GMT in cloudy conditions, according to images shown on its website www.solarimpulse.com . Heavy rain and strong winds had prevented it from taking off at 0230 GMT as scheduled. "The flight is far from being smooth and there have been a series of problems ever since the take-off from Brussels was delayed due to strong ground winds," a blog said. "Shortly after take-off, when the pilot tried to retract the landing gear there was an unusual noise," and he decided to abort the move, it said, adding that this meant the plane would fly more slowly and use up more solar power. The plane then turned back for Brussels, a spokeswoman for Solar Impulse told AFP. Solar Impulse HB-SIA, which has the wingspan of a large airliner but weighs no more than a saloon car, made history in July 2010 as the first manned plane to fly around the clock and through the night on the sun's energy. Last month it completed its first international flight from Switzerland to Belgium. HB-SIA relies on 12,000 solar cells on its 64-metre (200-foot) wings to charge the batteries that provide the energy for the 10-horsepower electric motors driving four propellers. It holds the endurance and altitude records for a manned solar-powered aeroplane after staying aloft for 26 hours, 10 minutes and 19 seconds above Switzerland, flying at 9,235 metres (30,298 feet). This time, the high-tech plane is expected to rise around 2,500 metres in altitude. The flight is being transmitted live on www.solarimpulse.com. The Solar Impulse team is aiming to make possible transamerican, transatlantic and round-the-world flights -- in stages -- in 2013 and 2014 using a slightly larger aircraft. The 49th international air show at Le Bourget, just outside Paris, runs from June 20 to 26.